Available in non-allergenic, nickel-free versions. Different models are suited to different uses. Prym Fashion India Private Limited was established in the year 2001. We are Manufacturer, supplier and trader of Press Stud Fasteners, Snap Fasteners, Prong Fasteners, Zip Fasteners, Jeans Buttons and many more. 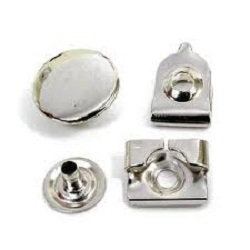 We produce a wide range of completely reliable fastening systems: press fasteners, zip fasteners, jeans buttons and rivets, eyelets and washers for every application. We develop and manufacture an almost limitless range of products to provide clients in the clothing, leather goods and textile industries with the best solutions to their needs. Our products and attaching technology (pneumatic presses, semi and fully automatic machines) are designed to provide a high degree of flexibility and consistency whether we are making standard or customized items, large or small batches, or closures for high fashion wear, active wear, baby, kidswear, jeans and workwear. We work closely with our customers, right through from the initial design stage to the production of the finished product, while we also offer made-to-measure attaching technology and on-site training. Our production sites and sales offices in more than 60 countries ensure that clients are provided with stylish and highly innovative products.